1. What is the recourse/best option for minority shareholders following failed attempt to remove certain directors who are deemed unfit to hold the directorship? In a public listed company context, there are limited options for a minority shareholder. Firstly, shareholders often resort to expressing their displeasure through a vote at a general meeting. The laws provide for avenues for shareholders to requisition the directors to hold such a meeting or for the shareholders themselves to hold the meeting. Often, the resolutions will be to allow the shareholders to nominate their own directors so that they have a greater say or to replace the Board entirely. But this route is predicated on having the numbers. There must be enough votes at the meeting to pass the necessary resolutions. Such attempts of holding a meeting may attract landmines along the way. Legal proceedings can delay the holding of the shareholder meeting as well as to challenge the resolutions. Such legal proceedings are expensive. Secondly, media scrutiny in the financial press can shine the spotlight on any failures in corporate governance. There may then be market pressure through the impact on the share price of the company. 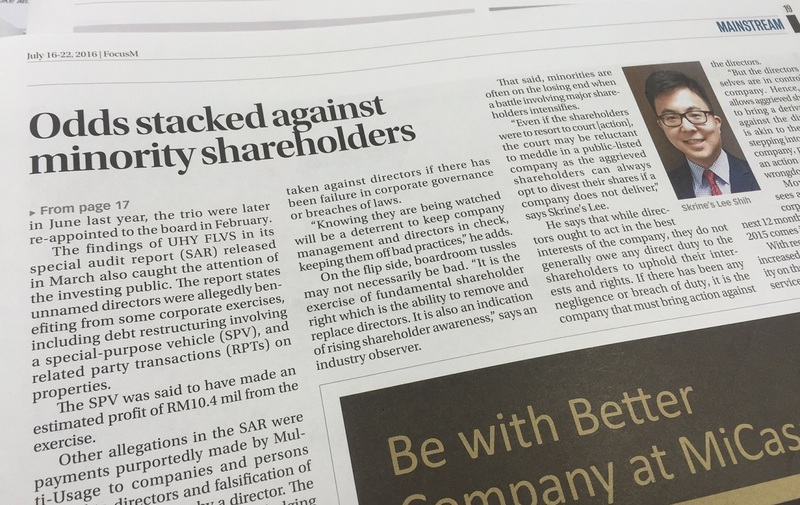 Thirdly, there may be regulator investigation and enforcement against the directors if there have been failures in corporate governance or breaches of the law. Further amendments to the law may be required to widen the possible remedies for aggrieved shareholders. In the Corporate Governance Blueprint 2011 by the Securities Commission Malaysia, two new options were considered. The first was to allow for litigation funding to assist aggrieved shareholders to institute private actions. The second was to allow the Securities Commission Malaysia itself to file a court action to seek remedy where the affairs of a listed company are being conducted in an oppressive manner to the shareholders’ interests. 2. What constitutes shareholders oppression and negligence in upholding shareholders’ interest and rights? An aggrieved shareholder can file a court action to seek remedies for oppressive conduct. This is where the company’s affairs are being conducted in an oppressive manner, there is disregard to a shareholder’s interests, or unfair discrimination. At the heart of the oppression remedy, is the question of whether there has been commercial unfairness. The starting point in determining such unfairness is an examination of the agreement between the shareholders, which would be the written contract and any implied understandings and legitimate expectations among the shareholders. If a breach of such an agreement has then led to prejudice, the shareholder may be entitled to seek the appropriate remedies. However, in a public listed company context, it may be difficult to establish oppression for two reasons. Firstly, the unfairness in an oppression case often springs from some form of personal relationship between the shareholders and directors. There may have been assurances or promises made and a breach can lead to commercial unfairness. This form of personal dealings among the shareholders and directors is often absent in a public listed company. Secondly, the pragmatic approach for an aggrieved shareholder in a listed company is to then exit by disposing the shares in the market. On a separate issue, you have mentioned negligence. Directors of a company do not owe any direct duty to the shareholders in upholding the shareholders’ interests and rights. Directors owe a duty to the company to act in the best interests of the company. So, it is the company that must bring an action against the directors if there has been any negligence or breach of duty. But the directors themselves are in control of the company. Hence, the law allows the possibility of an aggrieved shareholder to bring a derivative action against the directors. This is akin to the shareholders stepping into the shoes of the company, piloting the company to bring the action against the alleged wrongdoer directors.